“Hold These Truths” examines how Gordon Hirabayashi challenged the constitutionality of the forced relocation of Japanese Americans during World War II. When playwright and actress Jeanne Sakata asked her father about his teen years during World War II incarcerated at Arizona’s Poston Relocation Center, all he ever said were “very dirty” and one-word answers. It wasn’t until years later, when Sakata saw the documentary “A Personal Matter: Gordon Hirabayashi vs. the United States” by John de Graaf, that Sakata knew she wanted to see Hirabayashi’s story on the American stage. The documentary film inspired Sakata to write a one-person play, “Hold These Truths,” which celebrates its 10th anniversary this year. 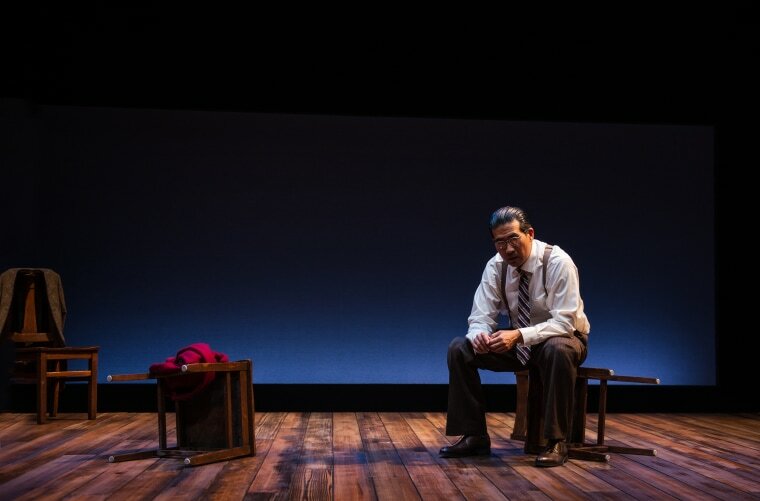 The 90-minute play featuring one actor playing 37 characters examines how Hirabayashi, then a young college student at the University of Washington, challenged the constitutionality of the forced relocation of Japanese Americans during World War II all the way to the Supreme Court. Gordon always saw his story as an American story. He was fighting his case, he felt, not just for himself but on behalf of all Americans who might encounter persecution in the future. An acting job brought Sakata to Seattle in the ‘90s, and she met and interviewed Hirabayashi. He was so warm and such a good storyteller that those conversations with him “filled in a lot of psychic gaps” in her own family’s story, she said. When “Hold These Truths” first premiered in 2007 at East West Players in Los Angeles, Sakata saw the play as a period piece shining a light on a chapter of history that many people did not know. But in the past few years, the play has seen a resurgence of interest. Since 2015, the play has had multiple productions and readings across the country, including Seattle; Portland, Oregon; Juneau and Anchorage, Alaska; Philadelphia; San Francisco; and Pasadena, California. The play is currently running at the Sheen Center for Thought and Culture in New York City and the Lyric Stage in Boston, and in early 2018, the play will have its Washington, D.C., premiere at Arena Stage. “In the last few years, as our country has lurched to the right politically, we have seen this story, Gordon’s story, become more and more immediately relevant. It seems almost like it’s a direct response to that is happening today,” Sakata said. Part of the appeal of the play, which Jessica Kubzansky, the director of the original production and the upcoming production in Washington, calls “a love story between a man and his Constitution,” is the deeply principled character of Hirabayashi, firmly anchored in his Quaker faith. Another appeal of the play is the ability of theater to reflect current concerns. Actors Ryun Yu — who originated the role — and Greg Watanabe both portrayed Hirabayashi at the time of the 2016 presidential election and found that the election changed the meaning of the role. The significance of bringing Hirabayashi’s story to Washington, D.C., the seat of the federal government, next spring is particularly powerful, Kubzansky noted. In the last few years, as our country has lurched to the right politically, we have seen this story, Gordon’s story, become more and more immediately relevant. Although Hirabayashi was criticized by the Japanese-American community at the time, he received the Presidential Medal of Freedom posthumously in 2012, and Sakata noted his story is perceived as a patriotic call to action for all Americans today.